Looking for a formal napkin for your fundraiser or evening dinner crowd? Our custom printed Paper Linen Napkins are the perfect option to fit any size function. With a thick linen like napkins texture, these paper napkins are an example of class and sophistication. Our custom printed linen like paper napkins are available in white tissue only; however, beverage and dinner napkin sizes are available. 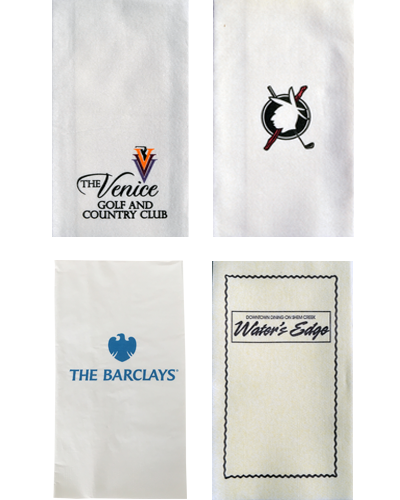 Let us bring your company brand to the next level by adding your 4 color logo to our super-sized personalized napkins. Linen like look and feel! Paper Linen Napkins will show your clients you are serious about your branded message! What is the minimum order requirement for custom printed Paper Linen Napkins? 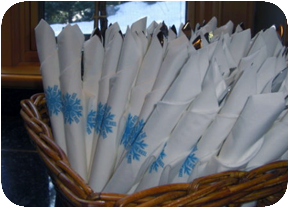 Our custom printed Paper Linen Napkins have a 12,000 piece minimum order requirement. Our small order requirements mean less inventory storage space is required. What is the production time for Paper Linen Napkins? Lead time for Paper Linen napkin orders is 2-3 weeks, although rush orders are available at an additional fee. What are your printed napkins printing capabilities? Paper Linen Napkins can be printed up to 4 spot PMS colors. We are able to match any PMS color on the chart with some metallic ink options also available. What type of art file is required for paper napkins? Bitmap files are never accepted as they are too low quality for proof making. Vector art files are preferred and Adobe Illustrator, .EPS and high resolution PDF files work best. If the line artwork is simple enough, sometimes a JPEG file will work. Need a price quote on custom printed Paper Linen Napkins? Contact us today! Looking for a cost effective way to brand your corporate message to clients? Custom printed Beverage and Cocktail Napkins are your best bet!